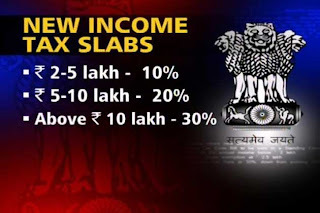 The cabinet has cleared new Direct tax code which is proposed to be implemented from 01-04-2011 onwards. The new Direct Tax code proposes to raise the basic exemption limit for individual tax payers from Rs 1.6 lakh to Rs 2 lakh. So there will be no tax on incomes below Rs 2 lakh. The exemption for senior citizens has been raised to Rs 2.5 lakh, up from 2.4 lakh at present. Direct Tax Code incorporates all three direct tax act; IT Act of 1961, Wealth Tax of 1957, Dividend Distribution Tax of 1997.The Bill also seeks to remove surcharge and cess on corporate tax, providing relief to business houses. According to the new direct tax code corporate tax rate will be 30 per cent including all taxes, down from the existing 33 per cent. Income between Rs 2-5 lakh is likely to attract a rate of 10 per cent, 20 per cent for Rs 5 -10 lakh bracket and 30 per cent above Rs 10 lakh. At present, income between Rs 1.60 lakh and Rs 5 lakh attracts 10 per cent tax, while the rate is 20 per cent for the Rs 5-8 lakh bracket and 30 per cent for above Rs 8 lakh. The Bill, approved by Cabinet, also seeks to impose minimum alternate tax (MAT) at 20 per cent of the book profit, compared to 18 per cent at present. As of now, it is proposed to provide the EEE (Exempt-Exempt-Exempt) method of taxation for Government Provident Fund (GPF), Public Provident Fund (PPF) and Recognised Provident Funds (RPF) ...", the revised DTC released by the Finance Ministry said. The first DTC draft had proposed to tax all savings schemes including provident funds at the time of withdrawal bringing them under the EET (Exempt-Exempt-Tax) mode. Under the EEE mode, the tax exemption is enjoyed at all the three stages - investment, accumulation and withdrawal. The earlier DTC draft had proposed to reduce the corporate tax to 25 per cent from the present 30 per cent. The revised proposal has also made it clear that tax incentives on housing loans will continue. Payment on interest on housing loans up to Rs. 1.5 lakh will continue. The earlier draft was silent on housing loans.